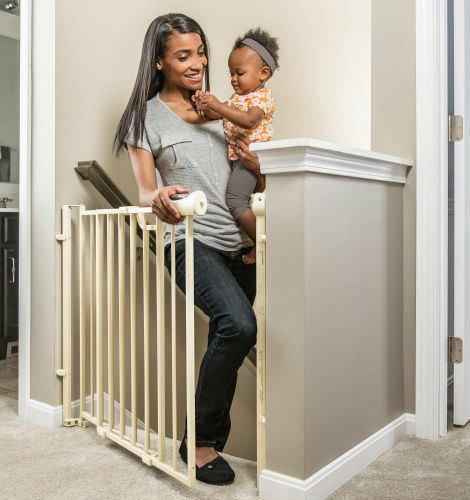 Walk through baby gates are a great option for those who need a convenient way to pass through the areas of the home that are blocked off from baby. The Summer Infant Multi-Use Deco Walk-Thru Gate is one of the most stylish walk through baby gates. Luckily there are many great options, which gate is best for you depends on your household’s needs. Are you looking for a walk through gate for the top of stairs? Or maybe you’re looking for a pressure mounted gate? How about an extra wide door? Whatever the case, we’ve been able to track down a variety of gates to fit an array of household situations. Hopefully through sharing we’ll be able to help you find your ideal walk through baby gate. Browse the table below to quickly compare our favorite walk through baby gates by width, height, average rating, and price. Continue reading below the table to get more details on three standout gates: one for the top of stairs, one versatile extra wide gate, and one extra tall gate. Each of these gates have earned high praise from parents and feature one-hand opening mechanisms for adults. Hopefully you found the comparison chart useful for determining which walk through baby gates will work best in your home. Below we go into more detail on a few of our favorite walk through gates. The North States Supergate is stylish, convenient, and versatile. No wonder it made our list of the best walk through baby gates! It is constructed in one single piece, but the side panels pivot so the gate can be adjusted to span any space between 38 and 72 inches wide. The gate and its walk through door are thoughtfully designed. The door is 25.5 inches wide to give adults plenty of room to pass through. The additional door features really make this gate stand apart from the pack, though. Firstly, the door latch lets adults open it one-handed, and it is self closing so you do not need to close the door behind you for it to lock. Further, this gate has a stay open feature that allows you to lock the door in an open position when needed. Perfect when you need to carry things through the sectioned-off part of your home! It can also slide out from the mounting hardware if you need to store it when it’s not in use. Having the option to easily detach of attach this gate to the wall hardware at will is a cool bonus feature. One thing to keep in mind is while 72 inches is listed as the manufacturer’s max-width, some reviewers have reported that the actual maximum width is 71.3 inches. If you need to span 72 inches on the dot this gate may come up a little short. However, there are 15″ extensions you can order separately if you like this gate but need a wider gate for your space. The Evenflo Easy Walk-Thru Top Of Stairs Gate is an affordable gate built with safety in mind. The highlight of this model is that it is specially engineered to be safe for use at the top of stairs. Focusing on the walk through features of this gate, it includes a child-proof, one-handed lever mechanism for opening it. To swing the gate open, adults can squeeze the buttons and push down on the lever. The combined necessity of pushing the buttons and putting weight down on the lever stymies busy little ones. The locking feature also has an color indicator so you can recognize if the gate is securely locked with just a glance. Unlike the North States gate above, this gate is not self-closing. Adults must push the gate back to the closed position. Because it is made for use at the top of stairs, this gate is made from a heavy duty metal. The Evenflo Easy Walk-Thru can fit spaces between 29 and 42 inches wide. The Summer Infant Multi-Use Deco Walk-Thru Gate stands out from other walk through gates for a few reasons. Firstly, unlike the other two highlighted gates, it is a pressure mounted gate that requires no hardware. Secondly, it is an above-average 36 inches tall. The door is located in the gate’s central panel and is 17.5 inches wide. One-handed operation of the door is also featured in this gate. Adding to the feature list of this model are auto close and auto-lock mechanisms. Further convenience is afforded by the door being able to swing in either direction. However, purchase includes a door stopper in case parents want the door to only swing in one direction. Any space between 28 and 48 inches wide will work for this gate. While it is pressure mounted, the gate comes with optional hardware for those who want the extra stability. This Summer Infant baby gate is also nice to look at. An elegant arched doorway and a pretty matte bronze finish can fit in nicely in many households. The main criticism about this gate is that the door is too narrow for some, so this may not be the option for you is you want a pass through larger than 17 inches.